Yesterday, a new dino dossier was published. 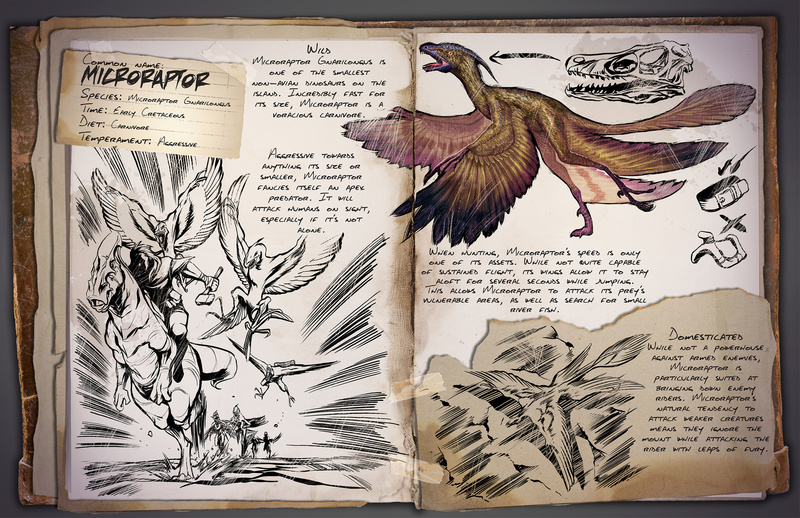 It provides information on the Microraptor, a rapacious little devil who is much more dangerous that its size woul lead one to believe. Wild: Microraptor Gnarilongus is one of the smallest non-avian dinosaurs on the island. Incredibly fast for its size, Microraptor is a voracious carnivore. Domesticated: While not a powerhouse against armed enemies, Microraptor is particularly suited at bringing down enemy riders. Microraptor's natural tendency to attack weaker creatures means they ignore the mount while attacking the rider with leaps of fury. Known Information: Aggressive towards anything its size or smaller, Microraptor fancies itself an apex predator. It will attack humans on sight, especially if it's not alone. When hunting, Microraptor's speed is only one of its assets. While not quite capable of sustained flight, its wings allow it to stay aloft for several seconds while jumping. This allows Microraptor to attack its prey's vulnerable areas, as well as search for small river fish.